William succeeded in making England essentially French, but it wasn’t ever going to be possible to convert a whole population in one go. What he did create was an ‘us and them’ mentality, the Anglo –Saxon peasantry separated from the Norman ruling classes by wealth, power and language. Like the remnants of a Celtic heritage that still linger across Western Europe, it’s true the ‘us and them’ mentality has stuck with the English right into modern history. Quite possibly it’s an engrained memory, much like the engrained memory that makes a baby instinctively cling to a washing line. 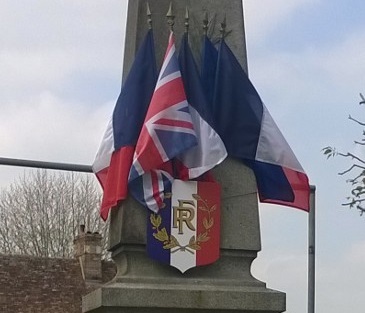 It may be that the English choose to find reasons not to like the French because subconsciously the choice is made to blame them for every working class hardship of the last 1000 years. But this is only one half of the argument. So where does the perception that the French don’t like us come from? Ah well you see. As my tour guide on the way to Monet’s garden some years ago took great pains to point out, pressing her red tipped fingers into the back of a coach seat with one hand and clutching a mic with the other like a hand grenade with the pin out, ‘it’s all the fault of Henry VI’. From 1066 to the coronation of Henry VII the first Tudor king in 1485, a Welshman with a dubious right to succession, the thrones of England, France and the Dukedom of Normandy were all hotly disputed and fought over. Thanks to Alfred’s dad’s holiday romance, succession was never a clear issue. Marriage alliances between England’s kings and nobles with nobles from provinces in France, created any number of spurious claims to the successions to the French throne. In turn England ended up with a series of Kings who either couldn’t speak English, spent their time on Crusades or chose to live in Normandy and had any number of feet in French Provinces. With all this uncertainty what followed was a bun fight between France and England that led to the 100 years war that lasted from 1337 to 1453 and ended the argument, at least for a while. There were lulls of course, temporary truces. Edward III who conveniently forgot that women (his mother Isabella) had no rights of succession and started 100 years war, eventually renounced his rights to the French throne. As did Henry VI who took the French throne legitimately, but ended up facing the first guns fired in anger and Joan of Arc and was left with only Calais. 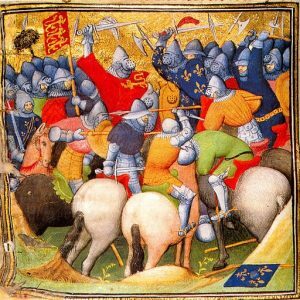 The French led by Louis VIII were in turn were more than happy to join forces wtih the rebellious Barons (major landowners) against John I in the English civil war of 1215-1217, when neither side failed to abide by the terms of the Geat Charter drawn up by the Achbishop of Canterbury to make peace between the unpopular King and rebel Barons. Though the French Prince dragged the conflict out after peace had been acheived,his ambitions for the English throne came to nothing. In 1217 the Great Charter was redrafted by Henry III and adopted under the new name of the Magna Carta. Despite of, or because of, for England the period of the 100 year’s war produced perhaps its most colourful era and beloved topic of many a history lesson. Events such as the Black Death, Agincourt, the Wars of the Roses, the princes in the Tower and the peasant’s revolt, feel almost mythological. In turn, characters like Henry V, the first English king able to read and write in English, Richard III who was either much maligned or fully deserved to end up in a car park in Leicester and Edward Tudor of Blackadder fame, have become part of the legend. 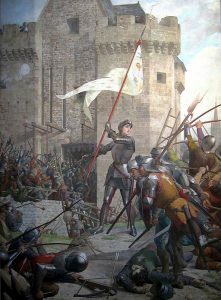 Perhaps the most romanticised figure of the 100 Years War was Joan of Arc. After inspiring the French to defeat the English at Orleans she was captured at the Siege of Paris by English allies. Then, because no one could come up with a more convincing reason to remove her from the warring equation, she was tried and executed as a heretic. As for Normandy, well King John (Richard the Lion hearts bad brother of Robin Hood and Magna Carta fame) lost that in 1204. The English failed to get it back again despite occupying it for two periods in the 100 year’s war and wiping out two thirds of the population in the process.